The beginning of the 20th century in Russia, as in the rest of Europe in terms of art and design, can be called the era of Art Nouveau. The visual arts, applied arts, furniture, theatre scenery and clothes all came under the influence of Art Nouveau designers and artists. Advertising posters were no exception. 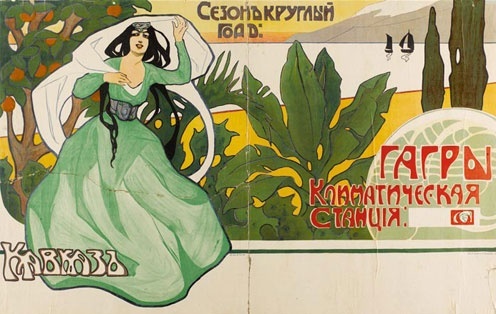 According to Nina Baburina, a historian of graphic art, the development of posters into a separate art form took place in Russia simultaneously with Western Europe—during the last decades of the 19th century. 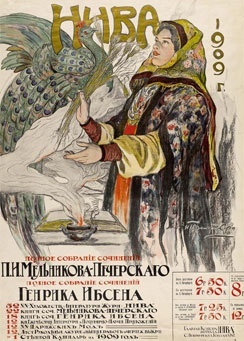 Thus, the first international exhibition of “artistic posters” took place in St. Petersburg in 1897 and presented works of foreign and Russian designers such as M. Vrubel, E. Lanceret (World of Art group), L. Bakst and others. Designers’ creations were divided into the following categories: industrial, socio-political and entertainment posters. Each class had its own visual vocabulary. 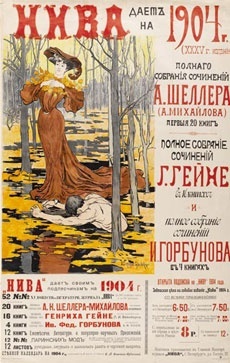 Under the section of entertainment posters, for example, artists often used themes from antiquity, allegorical stylizations as in K. Somov’s billboards for the exhibitions of Russian and Finnish painters (1898). 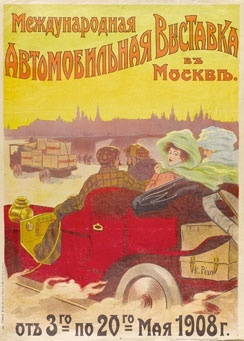 These were the advertising realities of early 20th century Russia. Advertising, publishing materials and posters in particular reflect the tastes of the audiences and their preferences. And here we can see what was in fashion in pre-revolutionary Russia.